February Foray to Lincoln City, OR Nets New Favorites! We've just returned home from a couple of days at Lincoln City. We were so fortunate to be visiting during another splendid, spring-like weather pattern: sunny and warm, t-shirt type weather. We hadn’t been in this central beach community for quite some time and thoroughly enjoyed ourselves rediscovering it. It was great fun to walk through our No. 1 favorite gallery in town, the Pacific Artists Alliance, and see the new works by local artists, including one in particular we admire a lot, Tim Power; his large copper salmon can be seen in one of the studio sets for OPB’s “Oregon Art Beat”. Tim is such a fine individual with a wonderful life story. His latest creations involve using a single strand of stainless steel wire to create fanciful creatures. We’re particultarly fascinated with his 3’ high sculpture of a tuna fish performing karaoke that was constructed using a strand of wire which is about 2,000’ in length! Magical! We were also glad to discover the North Lincoln County Historical Museum; what a find! Kudos to Director Anne Hall and her volunteers for such a delightful experience. I think that our favorite exhibit was memorabilia from the old Pixie Kitchen restaurant. Do you remember this long-time Lincoln City institution? It closed in 1985, but for many years was a "must stop" for lots of people visiting Lincoln City. As you entered the eatery, you encountered fun house mirrors, picture box tables, a great gift shop, and of course, the pixie-filled grotto full of mechanical pixies. Maybe the food was generally good (although not remarkable), but that didn’t matter because everywhere there was something fun and festive! 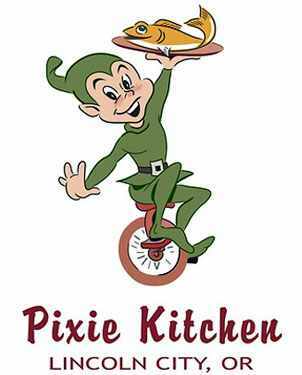 Surely, the world is a sadder place without the Pixie Kitchen…in fact, maybe the demise of the Pixie Kitchen is a sign of how low our civilization has fallen!